"This is an easy recipe that will amaze your guests with its elegance and complex flavors. The secret is using won-ton wrappers instead of pasta. 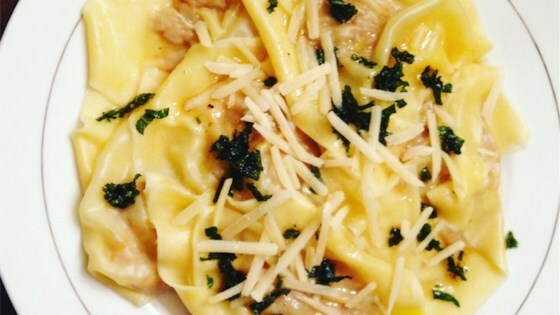 This raviolis can also be prepared ahead and frozen, which makes it even more versatile! Try experimenting with acorn, pumpkin or another winter squash." Place the squash cut side up on a baking sheet. Place 1 tablespoon butter in the hollow of each half. Sprinkle with salt and pepper to taste. Cover the squash with a sheet of aluminum foil tucking in the edges. Bake squash in preheated oven until tender and easily pierced with a fork, 45 to 65 minutes. Scoop the cooked squash into a bowl, and mash until smooth. Mix in the allspice, nutmeg, cinnamon, and Parmesan cheese until well blended. Season to taste with salt and pepper. Fill a deep pot with lightly salted water and bring to a boil. To make the ravioli, place a wonton wrapper on a clean, flat surface. Brush edges with the egg white. Place about 1 tablespoon of the squash mixture in the middle of the wonton. Cover with a second wonton wrapper. Repeat with remaining wonton wrappers and squash mixture until all have been used. Drop the ravioli into the boiling water, and cook for 3 to 5 minutes, or until tender. Remove, drain, and keep warm until sauce is prepared. To make the sauce, melt the butter in a skillet over medium heat. Stir in the sage. Continue to cook and stir until the sage is crispy but not browned. Add salt and pepper to taste. Place 6 to 8 raviolis on serving plates, and drizzle with sauce. See how to make surprisingly simple squash ravioli. The filling and sauce was awesome but I actually didn't like the wontons (too thin, they fell apart, see the pic I posted) and would make my own dough for this ravioli next time.